The German submarine U-45 was sunk south-west of Ireland, in position 50.58N, 12.57W, by depth charges from the British destroyers HMS Inglefield, HMS Ivanhoe and HMS Intrepid. HMS Ivanhoe torpedoed and sank the damaged British destroyer HMS Grafton in the English Channel. On 31 August 1940 a group of destroyers sailed from Immingham on a mine-laying mission off the Dutch coast. 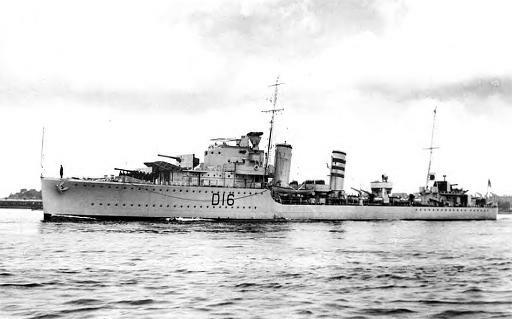 The minelayers were from the 20th Destroyer Flotilla and consisted of the destroyers HMS Express, HMS Esk, HMS Icarus, HMS Intrepid and HMS Ivanhoe. The minelayers were escorted by members of the 5th Destroyer Flotilla consisted of the destroyers HMS Kelvin, HMS Jupiter and HMS Vortigern. Aireal reconnaissance detected a German force and the ships of the 20th and 5th DF were ordered to intercept, believing wrongly that the German ships were part of an invasion force. HMS Express struck a mine and was badly damaged, HMS Esk went to her assistance and hit mine and sank immediately, HMS Ivanhoe also went to her assistance and hit a mine and was badly damaged, so much so she she had to be sunk by HMS Kelvin. The following day they were joined by the light cruisers HMS Aurora and HMS Galatea and while returning to base HMS Galatea struck another mine and was slightly damaged off Cleaner Shoal Buoy near the Humber light vessel.